Aristotle (384 - 322 B.C.) was an important Greek philosopher from the Socratic (or Classical) period, mainly based in Athens. He is one of the most important founding figures in Western Philosophy, and the first to create a comprehensive system of philosophy, encompassing Ethics, Aesthetics, Politics, Metaphysics, Logic and science. Aristotle was born to an aristocratic family in Stageira on the Chalcidice Peninsula of Macedonia (a region of northern Greece) in 384 B.C. His father, Nicomachus, was the personal physician to King Amyntas of Macedon, and Aristotle was trained and educated as a member of the aristocracy. Aristotle's mother, Phaestis, came from Chalcis on the island of Euboea, and her family owned property there. When he was just a boy of the age of 10, Aristotle's father died (which meant that Aristotle could not now follow in his father's profession of doctor) and his mother seems also to have died young, so he was taken under the care of a man named Proxenus. At the age of 18, he moved to Athens to complete his education at Plato's famous Academy, where he remained for nearly twenty years (first as a star student and then as a teacher and a philosophical force to be reckoned with in his own right) until after Plato's death in 347 B.C. Plato's nephew Speusippus (407 - 339 B.C.) was chosen to succeed him as head of the Academy (partly because Aristotle's ideas had diverged too far from Plato's) and Aristotle left the Academy. He traveled for some time in Asia Minor with Xenocrates (396 - 314 B.C.) and Theophrastus (371 - 287 B.C.). While staying at the court of Hermias of Atarneus, an ex-student of Plato, he met and married Hermias' daughter, Pythias, and together they had a daughter also called Pythias. After Hermias' death, Aristotle was invited by Philip of Macedon to tutor to the young Alexander the Great, which he did for several years before returning to Athens. His wife Pythias died soon after, and Aristotle became involved with Herpyllis from his hometown of Stageira, and they had a son named after Aristotle's father, Nicomachus. In 335 B.C., Aristotle established his own school just outside the walls of Athens, known as the Lyceum, in competition with Plato's long-established Academy, and he conducted courses at the school for the next thirteen years. His immediate followers were known as the Peripatetics (meaning "itinerant" or "walking about", for their habit of walking the covered walkways of the Lyceum). The Lyceum had a broader curriculum than the Academy, and a stronger emphasis on natural philosophy. Aristotle's most famous students were Theophrastus (371 - 287 B.C. ), who followed Aristotle as head of the Lyceum, and Strato of Lampsacus (225 - 269 B.C.) who succeeded him. It is during this period in Athens that Aristotle is believed to have composed many of his major works, although only fragments of his many dialogues have survived, and those mainly in treatise form, generally thought to be lecture aids for his students. His most important treatises include the six books of the "Organon", "Physics", "Metaphysics", "Nicomachean Ethics", "Politics", "De Anima" ("On the Soul"), "Rhetoric" and "Poetics". On the death of Alexander the Great in 323 B.C., anti-Macedonian sentiment in Athens flared once again, and Aristotle fled the city to his mother's family estate in Chalcis, explaining "I will not allow the Athenians to sin twice against philosophy" (a reference to the trial and execution of Socrates). He soon died of natural causes there, at the age of 62, and was eventually buried next to his wife. Aristotle himself divided his writings into the "exoteric" (intended for publication) and the "esoteric" (compiled from his lecture notes, and intended for the narrower audience of his students and other philosophers familiar with the jargon and issues typical of the Platonic and Aristotelian schools). Unfortunately, none of the exoteric works he produced for publication (which were praised throughout antiquity for their great beauty of style) seem to have survived, not even fragments, and so we have no examples of his literary art, as we have of Plato's writing. Even some of his esoteric works may well have been altered or "repaired" after the original manuscripts were left to languish in a cellar in Asia Minor before being rediscovered by some Roman scholars of dubious reputation in the 1st Century B.C. (although this account of their history is disputed). It was not until the Scholasticism and Averroism of the Middle Ages (when he was known simply as "The Philosopher") that Latin translations became widely available again, stimulating a revival of Aristotelianism in Europe, and ultimately revitalizing European thought through Muslim influence in Spain to fan the embers of the Renaissance. What we today call Aristotelian Logic, Aristotle himself would have labeled "analytics", and he used the term "logic" to mean dialectics (the exchange of arguments and counter-arguments in search of a synthesis or resolution). Aristotle's ground-breaking work on Logic were collected together into the six books of the "Organon" in the early 1st Century A.D., and it constitutes the earliest formal study of Logic. His conception of Logic has had an unparalleled influence on the history of Western thought, and was the dominant form of Logic until 19th Century advances in mathematical logic and predicate logic. As recently as the late 18th Century, no less a philosopher than Immanuel Kant claimed that Aristotle had said all there was to say on the subject of Logic. His aim was to develop a universal method of reasoning by means of which it would be possible to learn everything there is to know about reality. Aristotle defined logic as "new and necessary reasoning", "new" because it allows us to learn what we do not know, and "necessary" because its conclusions are inescapable. At the heart of Aristotelian Logic is the syllogism (or deductive logic or term logic), which he developed in his "Prior Analytics", the third book of the "Organon". In a syllogism, one proposition (the conclusion) is inferred from two others (the premises), each of which has one term in common with the conclusion. A proposition in this context is an assertion which consists of two terms (the subject and the predicate), and which is capable of truth or falsity. He enumerated ten categories to describe all the possible kinds of thing which can be the subject or the predicate of a proposition: Substance, Quantity, Quality, Relation, Place, Time, Position, State, Action and Affection. In other books of the "Organon", Aristotle considers issues in constructing valid arguments, probable inferences (as opposed to certain ones) and logical fallacies, among other topics. 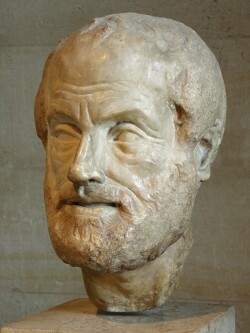 Aristotle also popularized the use of axioms (self-evident principles requiring no proof), claiming that nothing can be deduced if nothing is assumed, as well as the hugely important Principle of Non-Contradiction, which held that a particular attribute can not both apply and not apply to the same subject at the same time (e.g. 2 + 2 = 4 and 2 + 2 = 5 cannot both apply). The use of axioms was important in other areas of Aristotle's philosophy, not least in his Metaphysics. Aristotle's Metaphysics (the very word "metaphysics" dates back to Aristotle, originally having the rather mundane meaning of those books which come after his work on physics) revolves around the concept of substance, which is a combination of both matter (the substratum or "stuff" of which a thing is composed) and form (the actual thing itself). Things have both potentiality (what it is capable of doing or becoming, if not prevented by something else) and actuality (the fulfillment or the end of the potentiality). Thus, the matter of a thing is its potentiality, and the form is its actuality. Essence is what provides the shape or form or purpose to matter, and the movement from formless stuff to complete being results from four causes: material cause (what something is made of, the coming together of its parts), efficient cause (the motion or energy that changes matter), formal cause (a thing�s shape, form, essence or definition) and final cause (a thing's reason or purpose or the intention behind it). Aristotle broke irrevocably with his teacher Plato and the Platonists over the problem of universals and his conception of hylomorphism (the idea that substances are forms inhering in matter). Aristotle's conception of hylomorphism differed from that of Plato in that he held that Form and Matter are inseparable, and that matter and form do not exist apart from each other, but only together. Just as the word hylomorphism itself is composed of the Greek hyle (matter or stuff) and morphe (form or structure), Aristotle's classic answer to the question of what reality really consists of was that reality = stuff + structure. Stuff without structure was mere chaos, while structure without stuff was no more than the ghost of being. Plato believed that ideal Forms exist, separate and apart from particular things, for which they are prototypes or exemplars. Aristotle, on the other hand, held that universals exist only where they are instantiated, and then only "in things", never apart from them (i.e. the universals are �inside� the particulars). Where Plato had located ultimate reality in ideas or eternal Forms, knowable only through reflection and reason, Aristotle saw ultimate reality in physical objects, knowable through experience. Indeed, he considered it meaningless to discuss something which has not been encountered or experienced in real life. For Plato, the philosophic method means the descent from a knowledge of universal Forms (or ideas) to a contemplation of particular imitations of these, while for Aristotle the philosophic method implies the ascent from the study of particular phenomena to the knowledge of essences. Aristotle made some highly influential contributions to the field of Ethics. He considered Ethics to be a practical science (i.e. mastered by doing rather than merely reasoning) but also a general, rather than a certain, knowledge. Unlike some other moral philosophers before him, Aristotle started by posing the very general question of what it actually means to lead a good human life. He was also very aware that morality is a complex concept and so cannot be measured in any one simple way (in the way that Utilitarianism, for example, measures morality on a simple scale of happiness created). Also (again, unlike some other philosophers such as the Stoics and the Epicureans, for example), Aristotle firmly believed that we are not self-contained moral entities and that we cannot control our own moral environment. His several treatises on Ethics, most notably the "Nichomachean Ethics", outline what is commonly called Virtue Ethics or Eudaimonism. He argued that Man must have a specific or proper function, which is uncommon to anything else, and which is an activity of the soul. The best activity of the soul is eudaimonia (happiness or joy or the good life), which can be achieved by living a balanced life and avoiding excess by pursuing a golden mean in everything between the two vices of excess and deficiency. In Politics, Aristotle was the first to conceive of an organic city or natural community, and indeed conceived of Politics as a whole as organic, as a collection of parts that cannot exist without the others. For Aristotle, a city (the political unit with which he was familiar, the concept of the state as we know it still being then unknown) was a political partnership which existed for the sake of "noble actions", not merely for the sake of living together, nor as a social contract to avoid injustice or economic instability. In comparison with some other political commentators of the time (such as Plato), though, Aristotle's had a rather narrow-minded view of just who should be allowed to be a citizen of such a city, and his attitude to women and foreigners in general was quite chauvinistic. His formula for political stability was a strong middle class in order to achieve the middle ground between tyranny and democracy. He may also have been the author of a model constitution of Athens, in which the abstract notion of constitutional government is applied to the concrete life of a particular society. Aristotle's philosophical endeavors encompassed virtually all facets of intellectual inquiry, including "natural philosophy", the branch of philosophy examining the phenomena of the natural world (what would be regarded today as physics, biology and other natural sciences). In fact, he spent much of his time performing original research in the natural sciences, in areas such as botany, zoology, physics, astronomy, chemistry, meteorology and several other sciences, and to a large extent Aristotle was responsible for establishing these sciences as individual fields of inquiry and study. He was endlessly fascinated with nature, and went a long way towards classifying the plants and animals of Greece through observation and anatomical dissection. In Aristotle's physics there are five elements, all of which naturally move towards their default natural place: fire (hot and dry), earth (cold and dry), air (hot and wet); water (cold and wet) and aether (the divine substance that makes up the stars and planets). In his treatise "Meteorology" (then a broader term than its use today), he discussed the nature of the earth and the oceans, including the hydrologic cycle and natural occurrences like winds, earthquakes, thunder, lightning, rainbows, and meteors, comets and the Milky Way. His "De Anima" ("On the Soul") is perhaps the first ever book on psychology. In it, he argued that the mind is essentially the purposeful functioning of the nervous system, and he described the struggle of the id and ego (desire and reason). Unlike Plato, Aristotle took observation to be crucial, but (in the absence of concepts like mass, velocity, force and temperature, and given his insistence on deriving "laws of the universe" from simple observation and over-stretched reason, rather than strict scientific method, and his largely qualitative rather than quantitative approach) his scientific observations are a mixture of precocious accuracy and curious errors, and have long been deemed hopelessly inadequate. However, his project of a systematic investigation into natural phenomena in the living world arguably marks the birth of empirical science. Aristotle was interested in more than a strictly scientific exploration of human nature, though, as testified by works like the "Poetics" and "Rhetoric". Aristotle considered literature (e.g. epic poetry, tragedy, comedy), music and dance to be essentially imitative, although he considered such imitation to be natural to mankind and one of mankind's major advantages over animals.